I know I sound like a broken record but really, life has only been exciting since we moved to Louisville, Colorado. The mountain lion sightings continue, with the latest one being near an underpass on South Boulder Road, west of Washington Street on Monday June 13 at about 7:30 a.m. I first heard of this from an excited Medha when I picked her up from a camp she's attending at her school. Sure enough, Daily Camera confirmed it but the animal was not found. There have been sightings in Lafayette, a city to the east of Louisville. One woman reported seeing a mountain lion stroll by her home when she reviewed the tapes on her security cameras. We went for a bike ride yesterday and steered clear of mountain lion country! But this is not freaking me out as much as the other visitors we've recently encountered in our neighborhood. 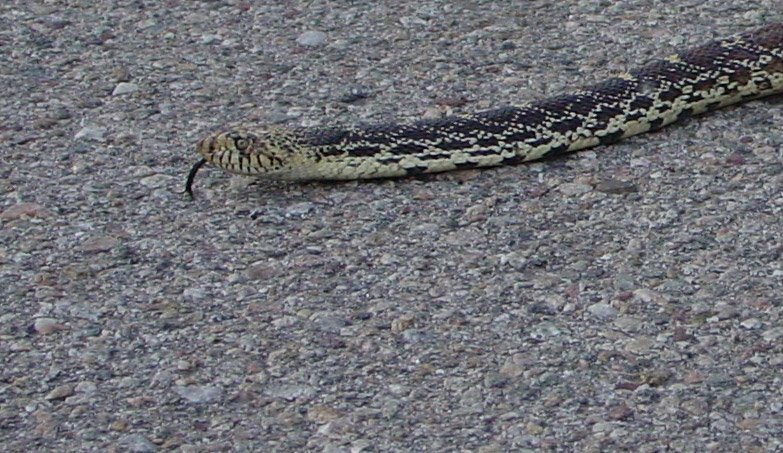 Fingers and toes curled, I stepped outside to see my neighbor lying prostrate on his driveway in an attempt to get as close to this reptile as possible. He petted it as did both the girls. So did my husband. None of us knew what kind of a snake it was nor did we know if it was venomous. Please do not do what these crazy animal and reptile lovers did. Stay as far away from a snake in the wild, especially if you don't know what kind it is. 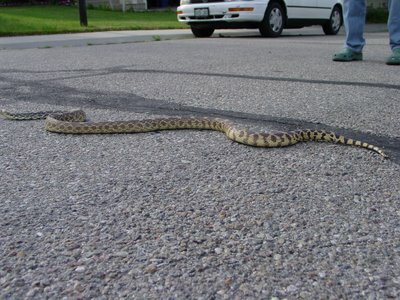 This was a bullsnake. Though not venomous, they do bite! ...and sought shelter from the crazy humans in some irises. 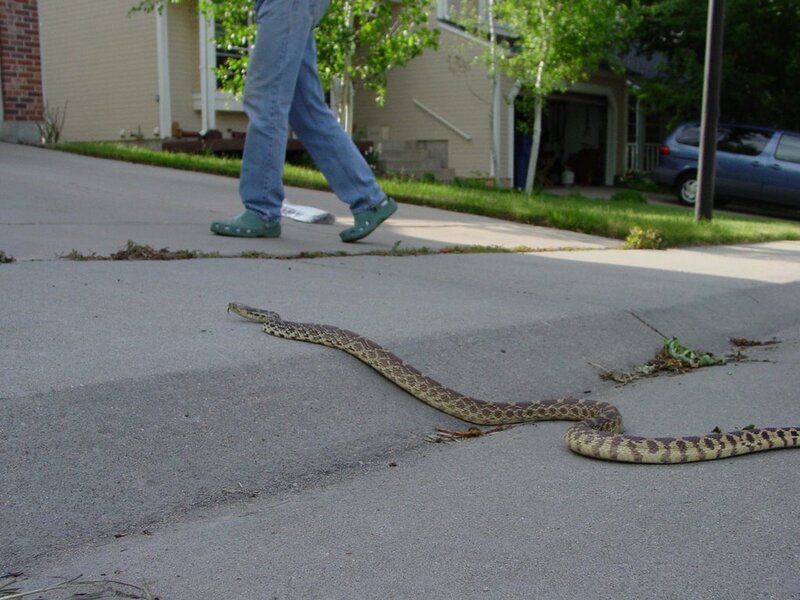 When I related this to another neighbor down the street, she told me she had not one but two bullsnakes living under her porch. I lost it when I heard that. That, to me, means there will be babies very soon. Her husband had caught one, put it in a sack and let it loose in the Open Space behind our homes. At the time, he didn't know that there was a fatter, second one still under his porch. 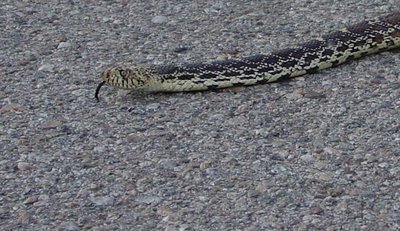 We think that the bullsnake we encountered was the one he released into the Open Space and it was trying to make its way back to its nest under her porch. No-one seems perturbed by the presence of these snakes. They actually like them as they say it keeps the rodent menace at bay. I am just so glad that our property does not back up to the Open Space. I haven't gone near my irises since then. I tap everything in the yard before I go near it or touch it. I freak out if something seems to move suddenly and very close to the ground. In short, I'm a wreck. And yes, despite all this, I let the kids campout in my backyard last weekend. I am the only one who is disgusted and scared of snakes. None of the kids are. According to everyone around, the snakes are far more scared of us than we are of them. They rarely come out at night. Yes, there are rattlesnakes, but they are rare; we have more bullsnakes in our neighborhood. The kids were in good quality tents, well zipped up such that no critters could get into them. You know, I grew up in Africa, but this here is the Jungle! Food is my source of comfort. Especially when I have everyone from my 8 year old to my husband to my neighbors laughing at me. At such times I need protein and I need spice, lots and lots of spice. What better than prawn balchao? Prawn balchao, for me, conjures up the images of old Bandra in Bombay. Narrow streets, lined by all kinds of shops that spilled out onto the street. A guitar being strummed by an old man sitting in his verandah in striped shorts, his beer within reach. Chatter in Konkani all around me. Smell of fish being fried...look where you're going, men! Getting pushed off the street into a gutter by a young man on a bicycle...I'm almost there. Take that last left turn near Junta Clothing Store into a narrow alley, take the first left into an even narrower alley, and then follow my nose to my friend Hazel's home. I loved going to Hazel's home. Auntie, as I called her Mom, would always go behind one of the many curtains that were used as screens in the home and emerge with a jar of delicious something. On one such visit, she pulled out prawn balchao and I was hooked. This is my adaptation of her recipe. Warm about 3 cups of water and add the Kashmiri chillies to it. This softens the outer skin and allows the chillies to blend better with the rest of the masala. Heat oil in a saucepan and add the onions. Sweat them till they are soft and almost translucent. Put the turmeric powder, ginger, garlic, mustard seeds, chillies, sugar and vinegar in a blender and blend into a fine paste. Add this masala to the onions. Watch out! Don't inhale when you are doing this as the fumes from the spices are very strong! Stir continuously on low heat for about 10 minutes till the masala has cooked. Add the shrimp and salt and cook on high until the shrimp turns pink and is cooked. This usually takes about 5 minutes, less if you have smaller shrimp. Add the tomato paste and cook for another 2-3 minutes. Serve hot or cold, with rice, as a side. It's up to you! 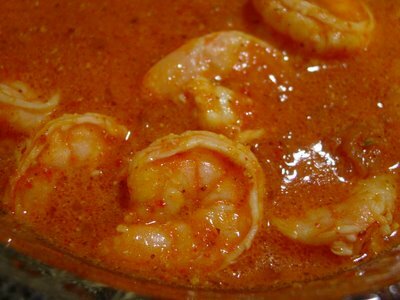 Hazel's Mom made this with a lot more oil and she also used dried shrimp for added flavor. She blended the dried shrimp with the rest of the masala and her recipe did not need refrigeration. Hers is the original Goan recipe. My adaptation uses a lot less oil and I prefer to refrigerate my prawn balchao because I don't want to take any chances with it spoiling. I savor every bite! The picture above does it no justice. It looks like shrimp in a tomato sauce. But it's much more than that. It's a tangy spicy piece of heaven. Hazel and her family don't live in old Bandra anymore. Their building was one of the many chawls that was torn down to make way for multi-storey multi-room apartment buildings. I remember visiting Hazel and her family on my last trip to India, over 3 years ago. Junta Clothing Store, which was my landmark in old Bandra, no longer exists. Gone were the old men with beers and guitars. The road was a tad wider and much dustier. And while I didn't get pushed off the street by a bicycle, I almost got run over by a motorbike. I told ya I am a scaredy cat! Here I am, sitting in my chair, with my feet up! I might have nightmares tonight. Btw you are tagged. Check my blog for more info. ho they are hair raising..it really takes a gut to pat these reptiles..lovely narration..
California parks are also considered mountain lion country but I have seen such warnings only in Yosemite and not anywhere else. Around here it is easier to get mugged than encounter a mountain lion. RP, I am learning to keep my cool. Deep breathing helps! Hope you didn't have nightmares! Mythili, thanks for the tag. This meme is going to be very difficult for me. I will try, ok? Sudha, guts? They're all foolish, I say! I made them all scrub their hands in hot water and then poured Purell over them, too. Medha kept coming to hug me and touch me with those hands and I continued to freak out. Yeow-uurgh! Mika, bullsnakes hiss loudly when threatened and attempt to impersonate a rattlesnake but it's a known that they are not poisonous. If I wasn't so repulsed by them, I might have looked up sites that say so but right now I am taking my husband's word for it as well as that of the folks in the 'hood. The mountain lion saga here is slightly different from that in Calfornia. Colorado issues hunting licences, Boulder will not allow mountain lions to be hunted so their population has grown. Also, their habitat is being encroached on by man and there is only one direction they can move - towards us in the foothills. Mountain lions are also known to be territorial in nature so that makes the problem worse. The abundance of prey (lots of deer) in the Open Spaces also makes it a very attractive habitat. Snakes are beautiful creatures. I am with your husband and daughter on that one! I have a similar recipe to your Prawn Balchao. And you are right, it's a piece of heaven. I think I should have been blind to miss this great rocking blog of yours! Wow! I couldnt take my eyes of this! RP posted a link on my blog about snakes, and thats how I came to your rocking food world! Wow! I need to read a lot!! I still dont know how I missed it. Jeez...if there is one thing that really freaks me out, it is a snake. We had a tiny snake in our garden few months ago which slid out from under a pile of cut grass as I was grabbing the pile. That freaked me out beyond measure. A few days later I found another one which was killed by our neighbourhood cat ( who also aims for our fish). I cant even imagine seeing such a big snake in my yard. Nice write up. Mountain lions and snakes...you got nice company. Be careful out there. Manisha, your pics remind me of my native. During summer, snakes used to come inside the house. I am damn scared about snakes :(. Manisha, i understand kids are naughty and when u refuse they do it more..:-).Btw manish i have just added you to my blogroll.You have great blog here. Omigosh, I could almost hear the sounds of old Bandra; your description was spot on! My apologies for not responding earlier. I was working through this past weekend and was quite wiped out by the intense brainstorming and team-work. Asha, so what if we can't agree on snakes - it's great to know you agree with me on the definition of heaven! L G,welcome to IFR! Better late than never, eh?! Just kidding. 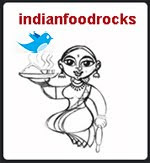 There are so many Indian food blogs, each with its own character that it gets difficult to keep up. I have been around for more than 3 years although I have become more active only in the past year or so. Gini, so now you know what's been going on in my neck of the woods! 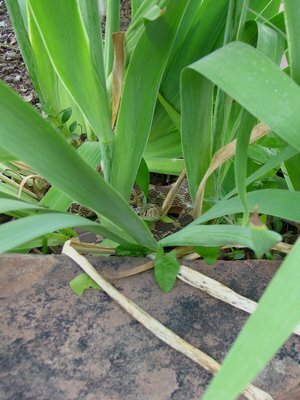 The kids found a garden snake (gartner snake) last week and carried it out to the Open Space on a long stick. I am learning to breathe deeply and come to terms with nature! Shammi, the way they move is what gets to me, too. I wonder if they feel the same way about us? :-D We also have coyotes, red foxes, quail, and deer besides snakes! Shilpa, I would have refused to go visit if I was you. But then again, who am I kidding - we don't have much of a choice, do we? What are the options open to me? I can't leave - we just moved here and we're loving it - everything from the neighborhood, the community, the schools - it's just what we were looking for. I knew about the snakes but never expected to see them right outside my home! Sudha, I wish I could be a kid again! The imp in me could get away with a lot in the guise of a child! I am honored that you think my blog is worthy of a link on your blogroll! Manisha!, what a beautiful name you have ;-)! And a Bombayite, too! Welcome to my blog! Snakes snakes....Just the very topic sounds interesting ,with a captured in live picture to boot..Manisha ,btw, your prawn balchao looks so colourful and tempting ,do plan to try this soon. Lera, welcome! Let me know what you think of the prawn balchao. I plan to try this out tonite! It reminds me our family dinner in goa. Thanks for this lovely recipe. My mom makes balchao for me using this recipe whenever I go to Mangalore.